David was at a conference in St. Louis this past week. Even though this was a work-related conference, I know he enjoyed the chance to get away for awhile and to wind down from some of the pressures he has been under. While he was there on Tuesday night, there was a full moon. 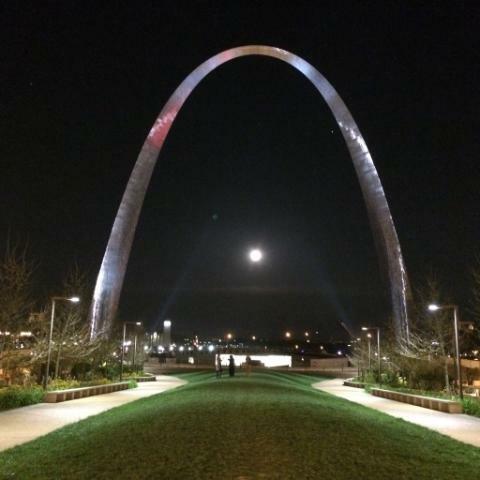 The weather was nice, so he went out to the plaza of his hotel and was able to take this awesome shot of the full moon positioned directly in the middle of the Arch. I love this shot. It is a reminder of how God's majestic creations can be found anywhere in the world. It is also a beautiful combination of man's God-given creativity (the Arch) with God's perfect handiwork (the moon). Genesis 1:14-15 - And God said, “Let there be lights in the expanse of the heavens to separate the day from the night. And let them be for signs and for seasons, and for days and years, and let them be lights in the expanse of the heavens to give light upon the earth.” And it was so. Psalm 19:1 - The heavens declare the glory of God, and the sky above proclaims his handiwork.